There's meat in the refrigerator. It could be the goat dish leftover from Eid. It could be a slaughtered cow. In either case, it isn't worth a lost life, or is it? 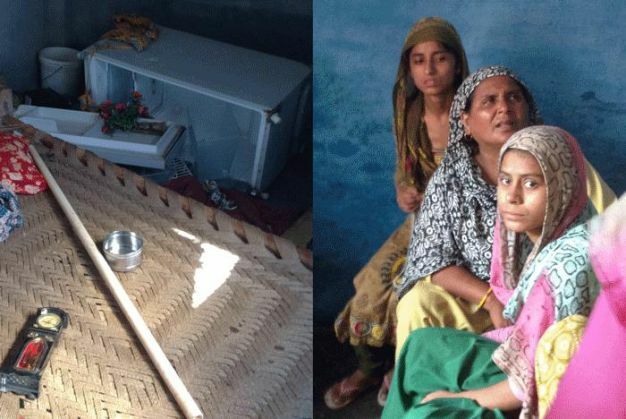 In a horrific turn of events, a mob barged into the house of a man in Dadri and decided that a piece of meat was indeed reason enough to beat a man to death. They first beat him to death, then beat his son to the extent that he needed hospitalisation, then attempted to molest his daughter, before finally checking the refrigerator for the catalyst - the "meat." In a local temple near the lynched Mohammad Akhlaq's house, a few days before the murder, the issue of a missing calf was raised. Rumours pointed to Akhlaq having kidnapped the cattle for consumption. Instead of raising the matter with the police, the villagers ascertained that its remains were found near Akhlaq's house. Sure, it is a crime to kill another's cattle, but must a temple be used to propagate communal hatred? After police arrived at the scene, Akhlaq's son Danish was taken to a hospital, and the meat was taken for forensic analysis to establish if it belonged to a cow or not. The UP government said the preliminary probe shows that there is no evidence that the family had stored beef in their house. Picture this, a man is lying dead because a mob wanted justice for a dead cow and the forensics still want to conclude the same. How does it even matter if it is a cow or a goat, or even a chicken? What's worse is that each time a reporter goes to the dead man's house, they ask his wife if it was goat meat from Eid or not, and each time, she repeats it was. There are a lot of sentiments attached with the cow ban. To put matters into perspective for those who love their beef, let's hypothesise this as a dog ban. Say dog meat was legal, and I as a dog lover, for non-religious reasons but reasons nonetheless, I want the same banned. I succeed and the ban is introduced in most parts of India. Now, I own two pet dogs. If one of them went missing and I was told my neighbour ate her, I'd be more than enraged. Don't laugh, this sort of thing has happened before. But would I call five of my friends and barge into my neighbour's house and kill him? Negative. The Hindu-Muslim conflict is an age old issue in India. But is the government, in certain ways, escalating this tension? The beef ban has been a point of strife between the two communities, and a case such as this raises the question of whether these bans are adding to the possible reasons for communal hate? As a Malayali, I never viewed beef as meat that was out of the ordinary. And now I do. While Chief Minister Akhilesh Yadav has announced a Rs 10 lakh compensation for the family, it can be easily argued that money wouldn't do much to ease the pain. But the acknowledgment is necessary, for there are the likes of ex-BJP MLA Nawab Singh Nagar to undo the little good the government is trying to achieve. Nagar, having established the universal law that "eating cow meat is wrong", went on to say that "there was no conspiracy." However, he really made his case worse when he said that the lynching occurred because of "excitement" on the part of the mob. A part of me earnestly hopes that this thoughtless comment, by some miracle, doesn't reach the family.